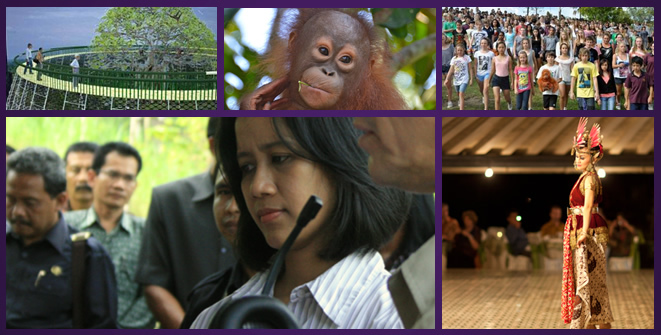 A Royal Start for DeforestACTION in 2012 | Collaborate for Change! « A new wave of hope for our forests – our best chance ever? Princess Gusti Pembayun - Princess of Yogyakarta to open the Global Education Leaders Briefing annual event this January and present on DeforestACTION. DeforestACTION will be the big news at the world’s largest educational leader meeting next week in London. From January 8, some of the world’s most powerful education ministers, policy makers and thought leaders will meet in London for the Annual Education Leaders Briefing (ELB). Hosted by the British Council to coincide with the BETT Show (the world’s largest education forum), this invitation only event provides a global platform for forward-looking debate with government, education systems and industry to inspire and achieve real change in education. Her Highness Princess Gusti Pembayun, of Yogyakarta, will be the opening keynote at this event, presenting on the importance of globally collaborative learning projects, and offering a global invitation for school systems around the world to join the DeforestACTION project. There will also be several other very big announcements about the project next week – but more on that later. There is strong commitment and support from the royal family of Yogyakarta, including Sri Sultan Hamengkubuwana X, to the DeforestACTION project, which will ensure large numbers of Indonesian students take the lead in the DeforestACTION project this year. The Princess will be joined by Dr. Willie Smits and Hasudungan Pakpahan, and will use London as the starting point for a global DeforestACTION promotional tour. I will be posting regular updates on Facebook, Twitter and this blog throughout the BETT week events, where DeforestACTION have a sponsored stand in the main pavillion. on January 14, 2012 at 1:52 pm | Reply Princess Pledges One Million Students to join DeforestACTION « Collaborate for Change!